Achieving minimal contamination of conductive material during manufacturing can prove to be a difficult task. One successful technique is known as levitation melting. 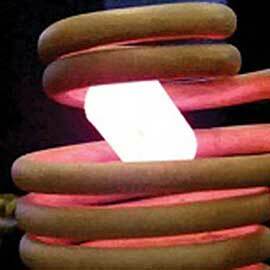 This technique produces small quantities of electrically conductive material by suspending and then melting the material with induction heating. Once the material has melted, the RF power is shut off, and the molten mass can be dropped or forced into a mold for forming. Potential for this application lies in the jewelry, dental, electronics, and aerospace research industries.